Starring: Hiroshi Ishikame, Yuriko Hishimo, Minoru Takshima, Toshiaki Nishizawa, Haruo Nakajima, Kenpachiro Statsumon, Koetsu Omiya, Kanta Ina. Synopsis: Cockroach aliens try to invade the world with space kaijus! People seem to think that remixes are a thing that DJs invented, but I say nay! It was really the Toho studio back in the 1970's. It really has become so easy to watch these Godzilla movies during this time period because they're literally just remixes of the previous movies so much, I'm just watch re-watching older movies at this point. GODZILLA VS. GIGAN's biggest saving grace is the fact that we get one of the coolest villains in the Godzilla canon, but the movie as a whole was........very lacking in just about every other way. To begin off with the good, we have a kaiju spiky chicken, Gigan, who has a freaking buzz saw stuck in his stomach that he uses to attack. Also he's BFF with King Ghidorah it seems. I know that he will be coming back later in the series during FINAL WARS, but it's a shame that his introduction is in such a lame movie. Now, Gigan as a character, is brutal in an unprecedented way in the series. I guess being a chicken with nothing but spikes for appendages will do that to you, but he clobbers Godzilla like no one's business. He constantly hit over the the point of temporarily blinding him and making him bleed. Not only that, but his Crazy Stomach Buzz Saw Attack was used to almost cut off G's arm off. 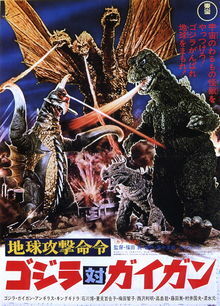 The highlight was the final fight of the movie where we have a tag team between Angilas and Godzilla versus King Ghidorah and Gigan. This has to be the longest fight of the series so far, and it's tons of fun. To set it up, the main villains of the movie, giant cockroaches inhabiting bodies of humans trying to take over the earth, lure Godzilla and Angilas to their main lair which just so happens to contain a laser that will help wipe out Godzilla and then finish taking over the world after they're destroyed. And the laser is in a tower that looks like Godzilla and is in the middle of a amusement park that's a cover for the evil alien operation. Apart from the lasers, they have other space kaiju to contend, and let me tell you, it doesn't really seem that they would be able to win. At one point, Godzilla is completely overwhelmed with the laser, and I have no clue as to how he survived. This does feature some of the craziest fight moves that the four legged Angilas has done where he launches himself so that his super spiky back hits the stomach of the enemy, Ghidorah. Now, this fight is actually indicative of one of the biggest issues of the movie, and it's the overuse of old stock footage from previous movies. It's very easy to tell because you can see that the film quality immediately becomes worse. Now, I'm not that skilled to know where all of the stock footage comes from, but I did notice an entire sequence that was used already in DESTROY ALL MONSTERS where Anguiras bites into Ghidorah while he's flying away. On a story level, the movie is just boring. It's basically every other space alien invader movie we've seen so far. Yes, there's a mysterious group of people that act shady, and just like always, they take control of King Ghidorah and any space kaiju out there. I think what really bugs me is just the amount of recycled everything: plot, themes, and even the music. Thematically, the movie deals with its theme of peace and technology in a really blunt manner by having the characters say it out loud. I am actually very interested to see why the last few movies have had such a low budget and needed to reuse so much of the stock footage, which might be another essay for this series. So as you can tell, there's really not much to this movie in my opinion. Between the over-reliance of stock footage and the familiar alien invasion plot that offers nothing new, I'd say that's a movie that can be skipped if it hadn't had a cool villain like Gigan.